Heat the oven (with the oven rack in the middle) to 350°F. Set out eight 4-ounce ovenproof ramekins. 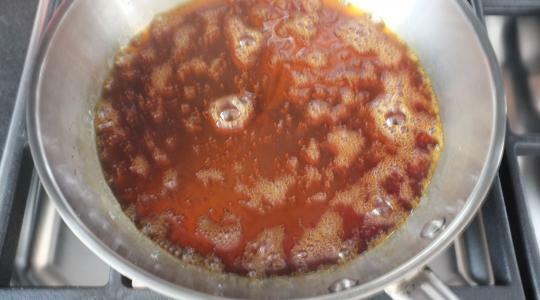 To make the caramel, in a medium skillet, combine the sugar and water over medium heat. As it heats up, the sugar will start to melt and bubble. 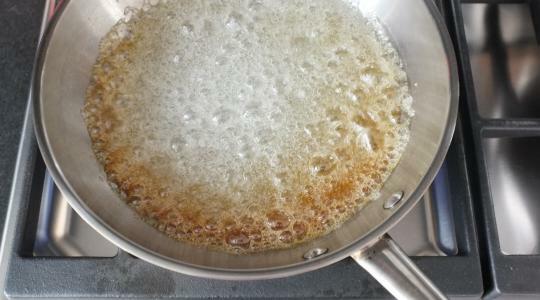 Once it starts to turn a golden brown around the edges, start swirling the skillet until the sugar has completely caramelized and turned a deep amber throughout. This will take 5 to 7 minutes from start to finish. 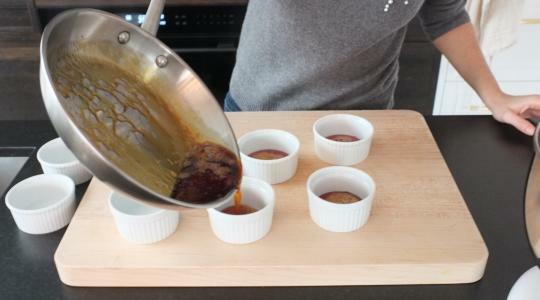 Working quickly and dividing evenly, pour the caramel into the ramekins. Be very careful…the caramel is extremely HOT. 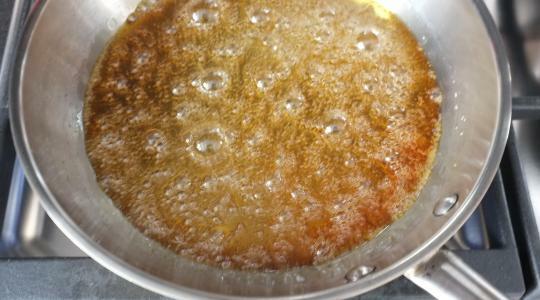 To make the custard, in a medium saucepan, heat the half-and-half over medium heat until hot (do not let it boil). 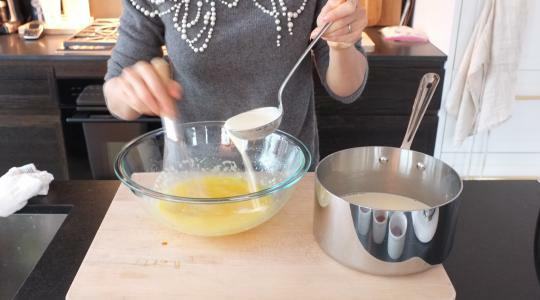 In a large bowl, whisk together the eggs until an even yellow. Add the sugar and whisk for about 30 seconds until well combined. Set the pan of half-and-half near the bowl with the egg mixture. Use a ladle to scoop out one ladle full of half-and-half. While whisking the egg mixture, slowly drizzle in the half-and-half. Repeat once more with another ladle full of half-and-half. (This is called tempering and it helps prevent the eggs from curdling when added to a hot mixture.) Now you can pour in the remaining half-and-half and whisk together. 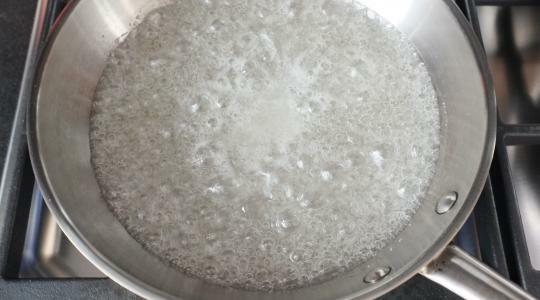 Use a spoon to skim off the foam from the top of the mixture. 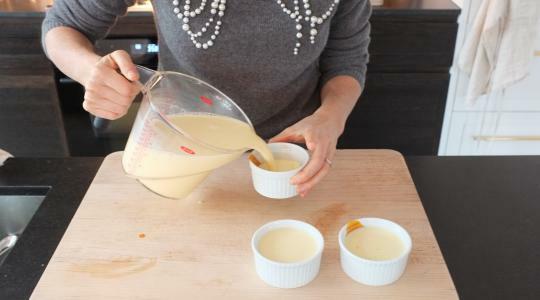 Pour the mixture into a large liquid measuring cup, then pour the mixture into the ramekins. Place a large roasting pan near your oven. Place the ramekins in the pan. Fill the pan with cold water half way up the sides of the ramekins. Carefully transfer the roasting pan to the oven. Bake until the custard is set (they will be a little wobbly in the middle), about 35 minutes. Let cool for 15 minutes then transfer to the refrigerator to cool completely, at least 4 hours or overnight. 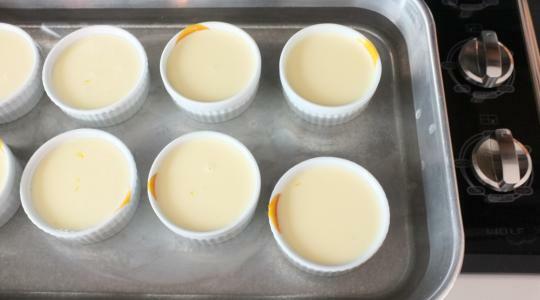 To serve, run a paring knife around the custard to loosen is from the ramekin. 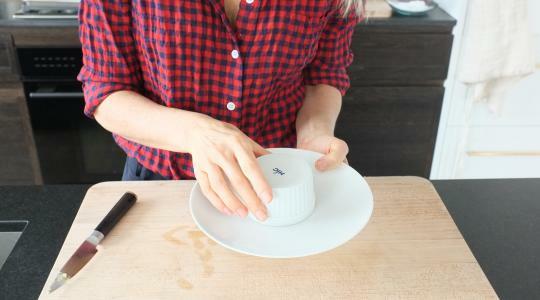 Slide the knife to the bottom of the ramekin to break the suction. 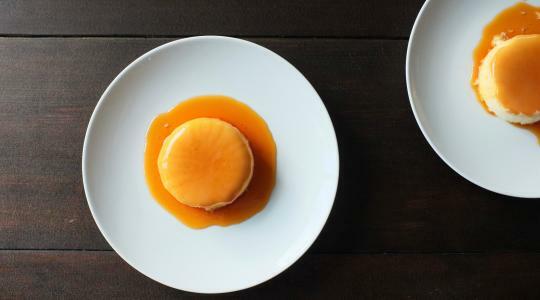 Invert the crème caramel onto a plate - the custard will slide out. Lift off the ramekin.